We recognize that your time is valuable and we don’t think a high-caliber workout should be ultra-expensive! 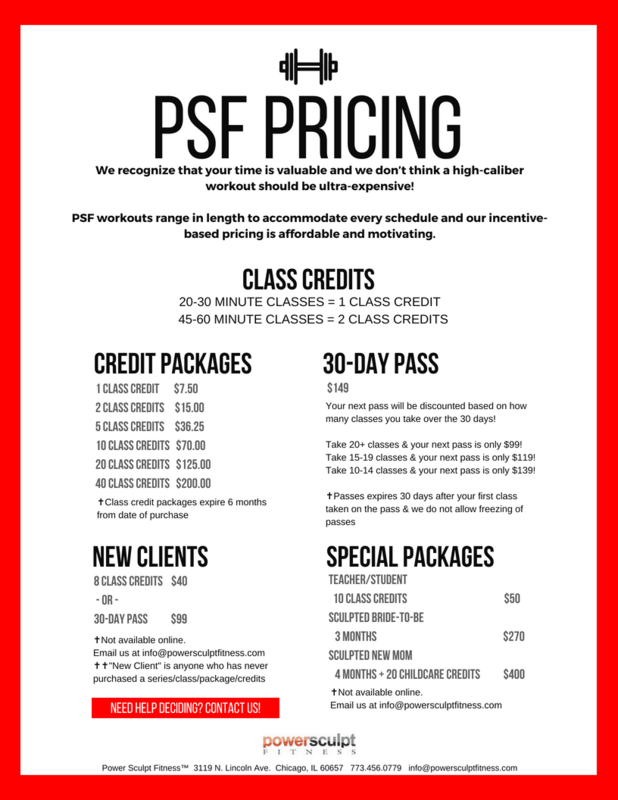 PSF workouts range in length to accommodate every schedule and our incentive-based pricing is affordable and motivating. Your next pass will be discounted based on how many classes you take over the 30 days! The More Classes you Take the Less you Pay! Your next pass is only $99! When you take 20+ classes during your 30-Day Pass, we will reward you! You’ll receive an unbelievable discount on your next pass just for being consistent. Your next pass is only $119! When you’re consistent, results will follow! Attend 15-19 classes during your 30-Day Pass and you’ll earn a discount on your next pass…it’s that simple! Your next pass is only $139! Your attendance determines the price of your next pass! Take 10-14 classes and we will discount your next 30-Day Pass so you can continue to rock your workouts! Take a Tuesday Evening Class, Get a Thursday Evening Class FREE! Take any of the following evening classes & get the immediately following class for FREE! All requests are subject to availability!